Sign Media, Inc. Publisher of Master ASL! 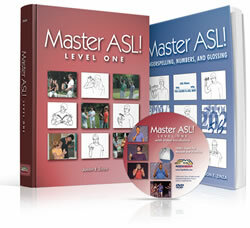 Sign Media, Inc. is the publisher of Master ASL!, the only American Sign Language curriculum designed to meet national and state standards for foreign language learning. Master ASL! now includes a new, updated DVD with an interactive Video Vocabulary of over 1,500 signs for student review and practice. NEW! SignMaster Game - ASL vocabulary review board game based on Master ASL!. SMI is a leading producer of books and video DVDs on American Sign Language, ASL teaching materials, interpreter training and American Deaf Culture. © 2011, Sign Media, Inc.